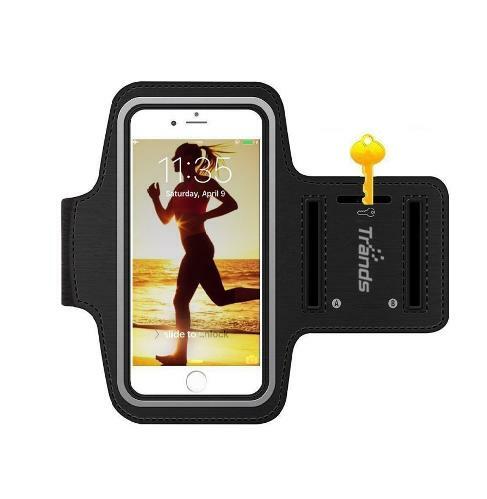 The Trands Sports Arm Band easily bends, twists & folds without warping. Comfort-grip keeps the band firmly on your arm during workouts and running. Headphone and charger cutouts allow direct access to the phone through the armband. Universal Sizing: Multi-Slot Adjustable Velcro Armband will fit almost any arm size up to 14". Compatible with iPhone 6/SE/5SE/5S/5C/5/4S (under 5.5"). Water-resistant design protects against water and sweat. Built-in key pocket: Secret compartment stores your house key while exercising.